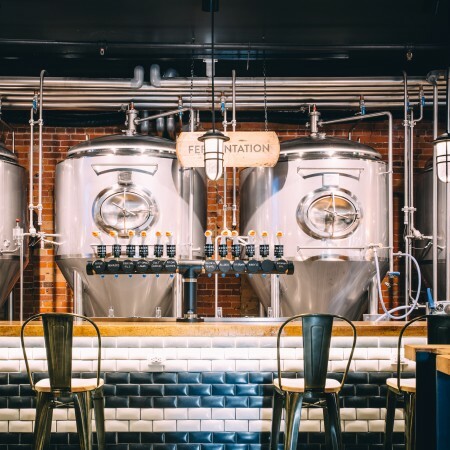 TORONTO, ON –Goose Island Brewery – a subsidiary of Anheuser-Busch InBev – has announced that after a short delay, the first Canadian location of its brewpub chain is now open in downtown Toronto. Goose Island Brewhouse Toronto opened yesterday (July 27th) at 70 The Esplanade, where it is co-located with Bier Markt Esplanade. Head Brewer Bernard Priest and Assistant Brewer Marc Mammoliti are producing batches of core Goose Island brands alongside their own creations, with the current line-up including ’59 Brown American Brown Ale, Off-Season Lager Marzen, Bitter Half English Bitter, Midnight Oil Coffee Porter, Cult Classic Munich Dunkel, Kaiser Geyser Kellerbier, Mantis Double IPA, Quite a Thing Saison, and Allora Raspberry Table Beer. Occasional rarities from Goose Island’s original Chicago location will also be available on tap from time to time. The food menu developed by Bier Markt Executive Chef Kevin Maniaci and Chef de Cuisine Shawn Jackson with change seasonally to use fresh and local ingredients, with dishes designed to pair well with the beers on tap. In addition to the bar and dining room, Goose Island Brewhouse features a retail store selling growlers of beer to go and branded merchandise, as well as a front patio and a rear Biergarten. For more details, see the Goose Island Toronto Brewhouse Instagram account.